Only part of the cake falls out of the pan. The rest is left behind, still clinging to the pan like a shy 3-year old. The good news is, you’ve got yourself a snack. If a cake really sticks to the pan, there’s not much else you can do except eat it. 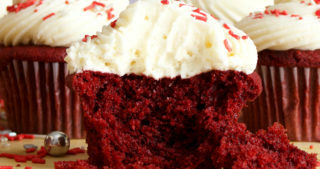 In general, drowning your sorrows in cake is probably not a super great idea. In this case, I feel it’s warranted, acceptable, and even expected. 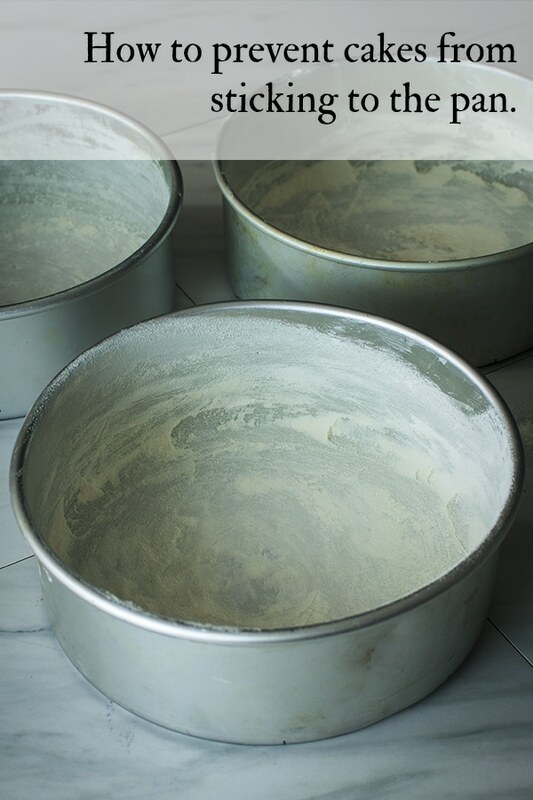 The BEST way to prevent your cakes from sticking to the pan is to grease and flour them AND line the bottom of the pan with parchment paper. 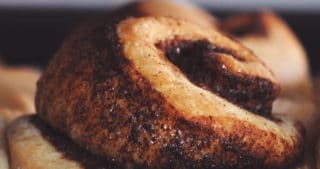 There are several terms that get thrown around in baking under the assumption that everyone understands what the term means. But, if you’re a new baker, this might not always be the case. “Grease and flour” the pan is one of those phrases. Once you know what it means, you’re golden. But, if you’ve never baked a cake, it might be slightly vague. 1. Cut out parchment to line the bottom of the pan. I always, always, always line the bottom of cake pans with parchment paper whether the recipe tells me to or not. If a cake sticks a bit to the sides of the pan, you can run a knife or spatula around the edges to loosen it. But, if the cake sticks to the bottom there’s not much you can do. 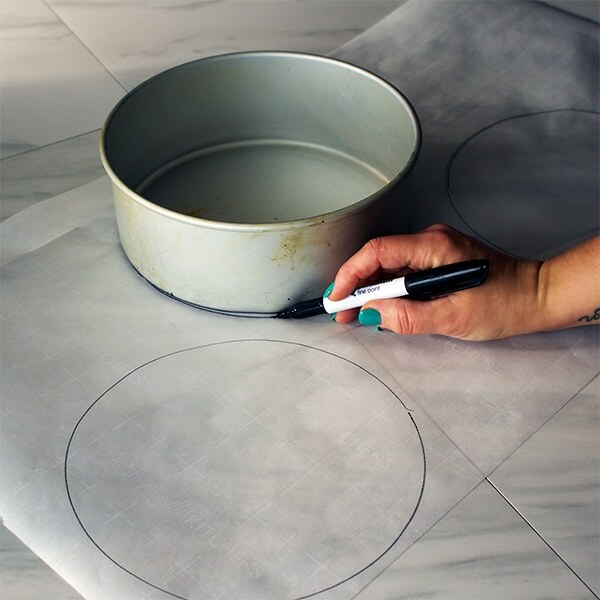 Roll out a sheet of parchment paper that’s large enough to trace enough circles for the size and number of cake pans you’ll be baking with. Then, use a sharpie to trace the bottom of the pan. Cut out the circles. #2. Grease the inside of the pan with vegetable shortening (or butter). 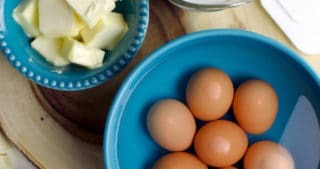 Either vegetable shortening or butter work well to grease the inside of a cake pan, and for the most part, you can use whichever you prefer. Butter will impart the cake with a touch more richness and flavor, but will also cause the sides of the cake to brown a bit. 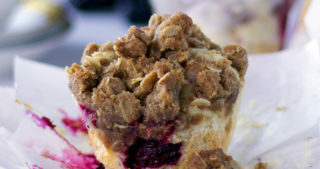 Shortening won’t add flavor (it won’t subtract from it either), but it will not cause the sides of the cake to brown. 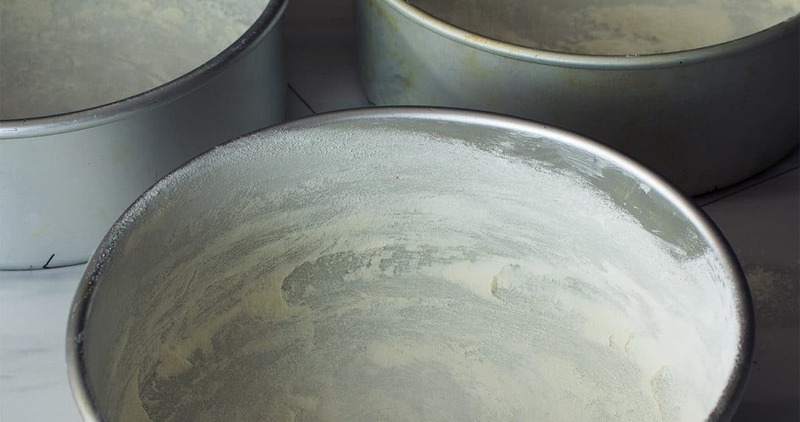 I’ve personally had more luck over the years greasing cake pans with shortening over butter. Water encourages the cake batter to stick to the pan, and butter is about 20% water. If you grease the inside of the pan with a generous amount of butter, the water content will likely not be a problem for you. But, most of the time, I don’t want to risk it. If you’re thinking that you WOULD maybe risk it because greasing the pan with butter will add another layer of flavor, this is really unnecessary. The amount of flavor imparted by greasing the pan with butter is minimal if not down right undetectable. 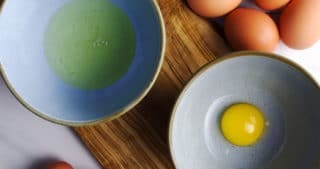 Unless the recipe specifically calls for you to grease the pan with butter, concentrate on ensuring that the batter itself is flavorful enough and use shortening to grease the pan. 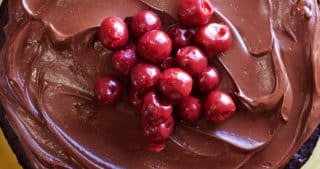 To grease the inside of a cake pan, simply scoop a glob of vegetable shortening into the cake pan and use a paper towel to schemer it around, coating the inside of the pan completely. You want to make sure there’s a good layer of shortening covering the bottom and sides of the pan without it being so thick that there are globs. Then, drop your parchment round inside the pan and press it onto the bottom of the pan. Pick up the paper towel you just used to grease the inside of the pan and rub some grease over the parchment paper as well. #3. Shake some flour around inside of the pan to coat. 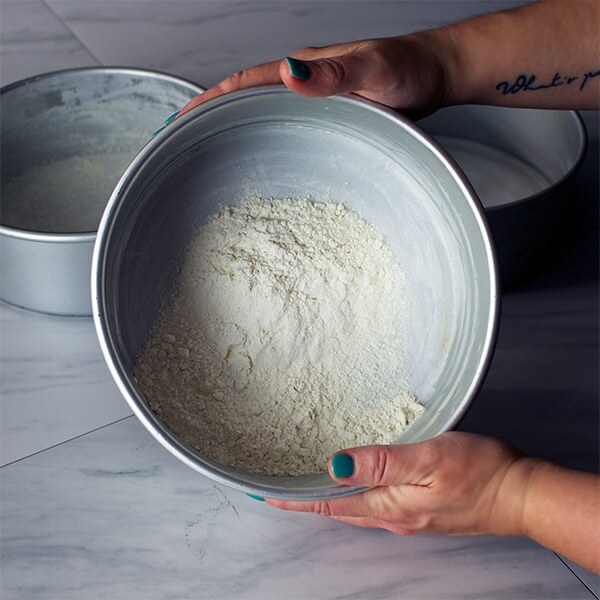 Scoop about a half cup of flour into the freshly greased pan and shake it around until there is flour coating every inch of the inside of the pan. 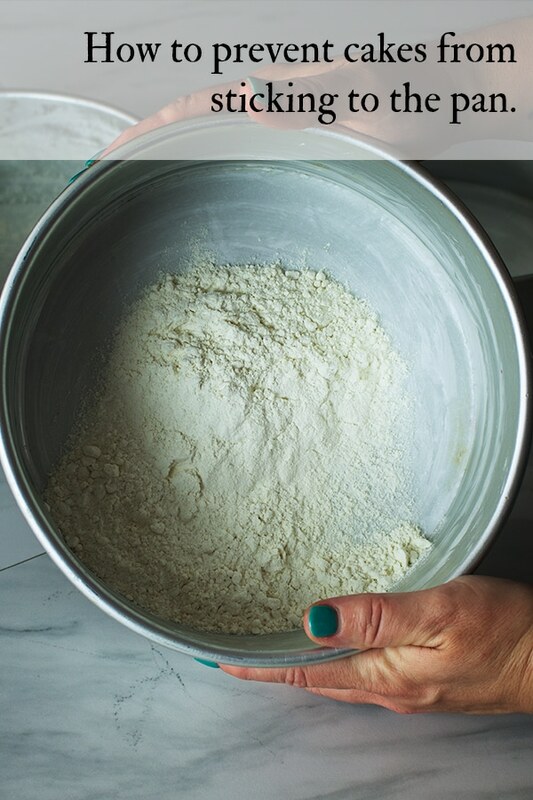 Turn the pan over, tap out the excess flour, and you’re ready to fill that pan with cake batter. Q: I have non-stick cake pans. Should I still grease and flour them? A: I would. 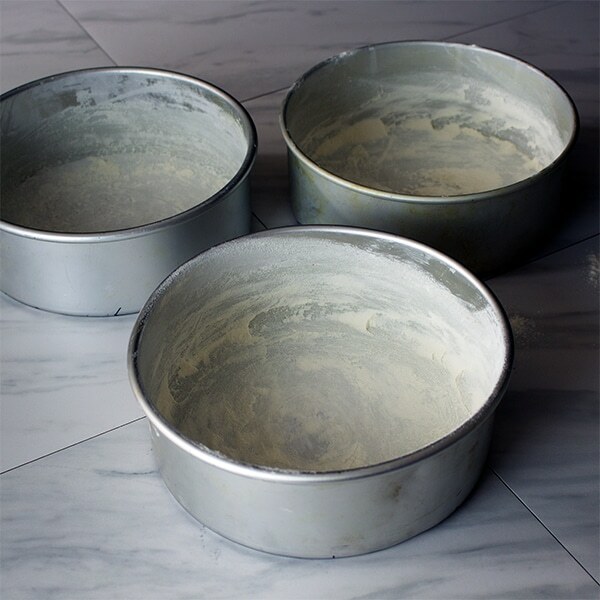 Cake pans with a non-stick surface will certainly help you to ensure that your cakes will come out of the pan cleanly. But, skipping the greasing and flouring altogether means putting more trust in that non-stick surface than I can generally muster. Q: Do I have to grease AND flour cake pans for every kind of cake? Will some cakes come out ok if I only grease the pan? A: You know the phrase “trust, but verify”? If a recipes says to only grease a pan, that’s the kind of logic you want to follow. Read the recipe – does the author offer a reason why you only need to grease the pan? If it’s a blog recipe, are there any comments about the cake sticking to the pan? Do a quick google search for similar recipes. Do they call for greasing and flouring the pan or only greasing it? After all that, if you’re still feeling uncertain, go ahead and grease, flour, and line the cake pan whether the recipe tells you to or not. The steps of cutting out parchment paper and flouring the pan will only take you a few extra minutes. The alternative – a cake that won’t come out of the pan – will cost you a heck of a lot more time (and ingredients!) then being a bit precautious up front. Q: Can I use non-stick spray to grease the pan instead of vegetable shortening or butter? A: I’m not gonna lie. I’ve done this a time or two out of shear laziness. Sometimes it works out fine and sometimes it doesn’t. If you love games of Russian roulette, this might be the kind of experience you’re looking for. Will it come out of the pan or won’t it? Oooooohhhhh, the suspense. Personally, this isn’t the kind of excitement I’m generally after. Mostly I just want to know for sure that the cake will come out of the pan. If you agree, grease the pan with vegetable oil or shortening, line it with parchment paper, and coat the inside with flour. 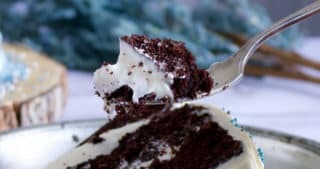 I like to use Wilton Cake pans that at least 2-inches deep, and preferably 3-inches deep. 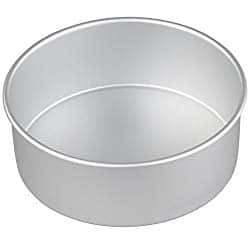 You can purchase cake pans that are more shallow, but might run the risk of having cake batter spill out over the sides of the pan onto your oven. This is not a fun situation, so I opt for deeper cake pans.